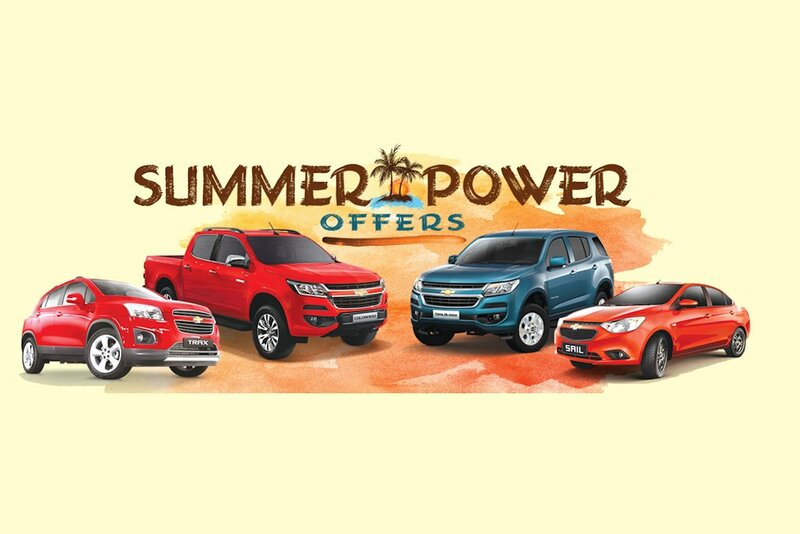 Beat the heat with a cool new ride as Chevrolet Philippines offers exciting deals with its Summer Power Offers Promo. The promo offers cash savings on select Chevrolet models, namely the Trailblazer, Colorado, Trax, and Sail. The new 2017 Chevrolet Trailblazer midsize SUV brings together superior levels of refinement, styling, safety, comfort, and technology to meet the versatile demands of increasingly discerning motorists. It boasts of a refined exterior and newly designed dashboard, but still maintains its powerful performance on the road with its 2.8L Duramax four-cylinder turbo-diesel engine. The new Trailblazer features the latest 8-inch touchscreen Chevrolet MyLink Infotainment System that has Bluetooth connectivity and multiple smartphone OS compatibility. It also has a remote engine start function that cools down the cabin on these hot days. Enjoy P 90,000 cash savings on the new 2017 Chevrolet Trailblazer 4x2 LT AT. With its redefined design, excellent handling and serious off-road capability, the new 2017 Chevrolet Colorado is truly a tough and capable pickup truck that matches any lifestyle. The Chevrolet Colorado boasts a tough yet sophisticated appearance, making it an ideal truck for work and play. It has best-in-class power at 200 horsepower and 500 Nm of Torque, 800-mm wading depth, and class-leading 1 ton payload and 3.5-ton towing capacity. The new 2017 Chevrolet Colorado comes with a host of active and safety features, plus a remote engine start function that is useful during hot weather. Enjoy P 50,000 cash savings on the new 2017 Chevrolet Colorado 4x2 LT AT. The Chevrolet Trax is a stylish crossover SUV that is packed with safety features, efficient performance and up-to-date technology. It has a class-leading array of advanced safety systems including 6 airbags, Panic Brake Assist, Roll Over Mitigation, Electronic Stability Control and Hill Descent Control. Its segment-first 1.4-liter turbocharged engine provides efficiency in city driving and power on the open road. The Chevrolet Trax also comes with a 7-inch touchscreen Chevrolet MyLink Infotainment System with Siri Eyes Free that allows hands-free connectivity, wherever you are on the road. Enjoy P 75,000 cash savings on the 2016 Chevrolet Trax LT. The Chevrolet Sail provides a comfortable and smooth driving experience for those long out-of-town drives. It is powered by either a 1.3-liter engine with 5-speed manual transmission or a 1.5-liter engine with 4-speed automatic transmission. It boasts a 9-inch touchscreen infotainment system, 16-inch gunmetal alloy wheels, sunroof and advanced safety features such as Anti-lock Braking System (ABS), Electronic Brakeforce Distribution (EBD) and driver and passenger airbags. Enjoy P 80,000 cash savings on the Chevrolet Sail 1.5L LT AT or P 60,000 cash savings on the Chevrolet Sail 1.5L LTZ AT. The Chevrolet Trax and Chevrolet Sail come with a 5-year warranty program, which offers coverage of five years or 100,000 kms, whichever comes first. The Chevrolet Trailblazer and Colorado come with a special 5-year warranty coverage: 3-year bumper to bumper warranty plus a 2-year warranty on the Power Train or 100,000 kilometer, whichever comes first. 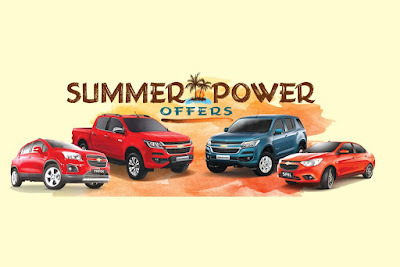 Avail of the Chevrolet Summer Power Offers Promo until June 30, 2017.